An Australian betting company has flown a giant hot air balloon shaped like Rio De Janeiro's popular Christ the Redeemer over the city of Melbourne. Watch the full video here. The bookmaker claims that the video is to encourage Soccer fans to 'Keep the Faith' by launching a hot air balloon in support of Australia's Socceroos. However, it was reported that the 151-foot Jesus balloon wearing a World Cup shirt with the words "#KeepTheFaith" on the back has earned outrage not only from netizens but to some politicians and business executives. Fans and locals were disgusted with the publicity stunt which has been seen as disrespectful and insensitive. 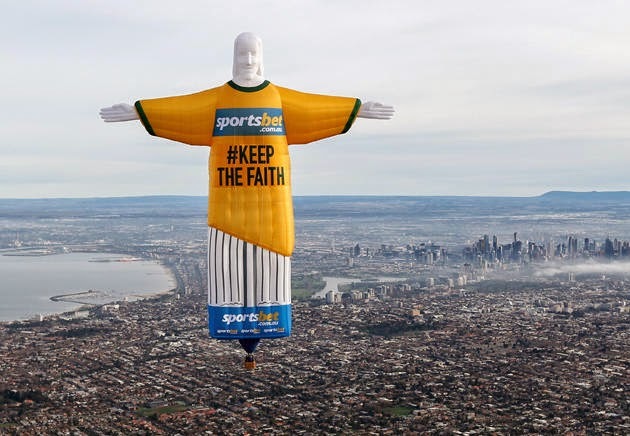 Perth's news organization in Australia has tweeted: "Outrage after a giant Christ the Redeemer balloon is launched over Melbourne as part of a World Cup campaign." Rev Costello, the chair of the Australian Churches Gambling Taskforce said: "One of the great statues in Rio is Jesus, and Brazil is a Catholic nation that takes its faith seriously and its football fanatically." Australian Socceroos will play against teams from Spain, the Netherlands and Chile in Group B at the 2014 Federation Internationale de Football Association (FIFA) World Cup set to take place in Brazil starting June 12 to July 13. Meanwhile, the sportsbook handicappers have installed Brazil as the favorite to win the 2014 World Cup. Argentina, Spain and Germany are the other contenders that could derail Brazil's chances.